Shrikhand is flavored, thick sweet yogurt. When I came to Gujarat, and was offered Shrikhand, I refused to eat it.Curd and sweet, an absolute no no.Trust me all these years have passed by and it is only after I started blogging, I tasted it.I felt I should know the basic flavor of the dish to get it right. I will confess that it is actually not as bad as I thought, it is just that one needs to develop certain flavors.At home everyone likes it, specially with a poori. Now liking and eating are two different stories. Let us not get into that. 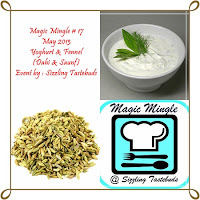 Kalyani announced this months Magic Mingle and our star ingredients are Curd and Fennel seeds.I made this over the weekend, hence decided to post it for Weekend Cooking too. My friends Valli and Champa join me for this every weekend.Do check out what they have been cooking . Tie curd in a muslin cloth and place it in a strainer over a bowl. Place it in the frig for 2 - 3 hours. Discard the water and sieve the thick curd. Add powdered sugar, cardamon pwd and fennel seeds powder. Garnish with fennel and cardamon powders.